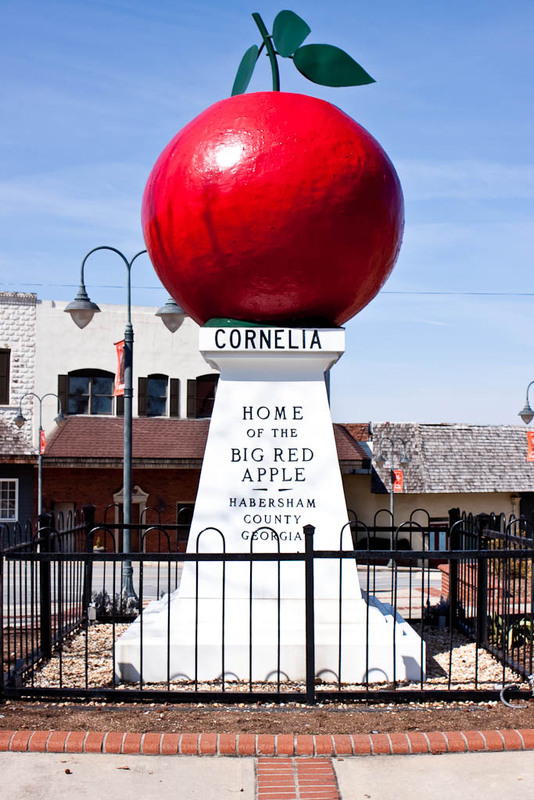 Cornelia, Georgia, home of the Big Red Apple, Jaemor Farms and a local eatery called “The Steakhouse”. In the South its ok to just call something what it is. Stone Mountain. Only in the South do we take a unique and picturesque natural, geological occurrence of nature and carve pictures on the side of it….and we’re proud of it, even if we do sometimes take it for granite. Hiawassee, Georgia. Proof that God took a little extra time with North Georgia when he was in the planning process although today it ranks as the only town I know of that has more signs than Times Square in New York. Front Porches. All the problems of the world could be solved while sitting on the front porch of graceful old homes after a big dinner and the neighbors were always welcome to come on up and sit a spell. Sometimes just sitting was a good way to spend the afternoon. Driving Miss Daisy. Most of us had a grandmother like Miss Daisy and wish we still did. My favorite line is “are you trying to irritate me in the middle of an ice storm?? ?” and I’m still mad that Morgan Freeman didn’t get the Oscar for his part. Southerners know that pot liquor is not an alcoholic beverage served in a pot. Rednecks. If you run your car off the road into a ditch (or get mired in the sand of the beach as I did during my senior trip) never fear: four rednecks in a 4 x 4 pickup with a beer cooler and a heavy chain will be along to pull you out. They live for this. Monticello, Georgia. My second favorite hometown full of lovely old homes, friendly people, a state championship football team and the two things its known best for: the home of Trisha Yearwood and the cleanest, best Dairy Queen to be found in the Southeastern United States. How many people will drive 20 miles to eat a Dairy Queen? You’d be surprised. The Law. Everywhere else it’s a codified set of rules and regulations designed to govern society. Down here it’s a Crown Victoria with flashing blue lights in the rear view mirror of your’84 Chevy Camaro-the same Camaro that just moments before actually had some tread left on the tires. Southern Lawyers. In the South, it is acceptable to make a living while just “practicing” the law and each county has at least one lawyer that we are absolute in our belief was the character that “Matlock” was modeled after. Justifiable Homicide: “He needed killing” has been and can be used as a valid defense strategy. Krispy Kreme Donuts. These are their own food group in the South and if you don’t know what one is, your school/church/civic club obviously never had a fundraiser. Krispy Kreme is a staple of the South and if it’s not a Krispy Kreme, it just isn’t a donut. Tupperware: The good Lord decided that he needed to reward Southern ladies for being such wonderful cooks so he made sure that they had a vessel worthy of holding all the leftovers. Hint: if someone brings you something in Tupperware, you had better make sure they get it back-they WILL come looking for you. Tractors-the only motorized vehicle that you can legally drive as slow as you want to, in the middle of a state highway with 47 cars backed up behind you. If it happens to be a John Deere, most everyone will forgive you. Trucks-Down here, a truck is actually a tractor-trailer vehicle (also known as a Semi [Sim Eye] used to transport goods and is often the source of the traffic gum-up on I-75. A pickup on the other hand is a valued member of the family and may be handed down to future generations. These are typically a Chevy, a Ford, a Dodge and sometimes a GMC. Everything else is a wannabe. Gardens. We have a garden for just about everything, from roses to vegetables and each are given an equal measure of time and attention, plus anything you grow is meant to be shared. There is nothing like coming home and finding an Ingle’s grocery bag of home-grown tomatoes on your front porch. Courthouses. Much cheaper than the movie theaters and oftentimes a much more entertaining venue. 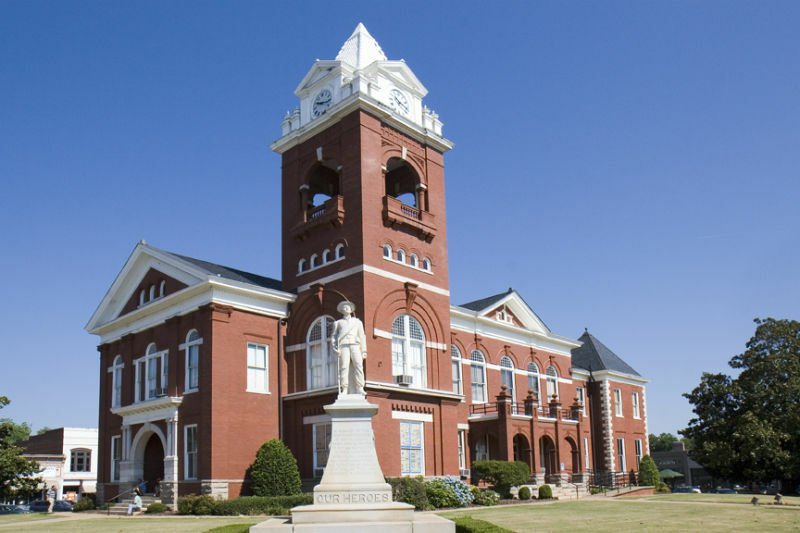 To be an authentic Southern Courthouse, it must be at least a hundred years old and have a four-sided tower with a clock that tells a different time on each side and a bell that starts ringing in the middle of the night for no apparent reason. If you have one, pigeons will journey from hundreds of miles to see it and leave a donation. Bonus points if you have a Confederate monument on the lawn. Hartsfield Airport. The only mall in Georgia that just happens to have valet parking for a 747. The Southern Railway. Merge it, split it up, paint it a different color, but to us it will always be the Southern Railway. Deer Season. A tactic invented by the insurance industry to mitigate automotive accident claims. Also designed to make camouflage acceptable as casual attire. In Monticello they hold an annual festival to the Deer. Sunday Best. In the South, this doesn’t just refer to what you wear to church but also implies the day of the week you had better exhibit your best behavior, that you eat your best meal of the week after church, and it is the best day of the week to take a nap . The Power Company. Also known as “The Co-Op” and considered to be the most stable job source in the South. Southerners are always going to need air conditioning. 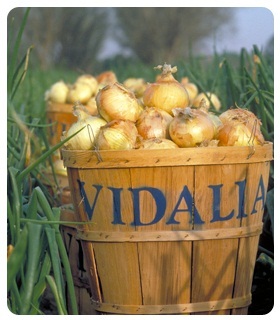 Vidalia Onions. A Vidalia onion is the cognac of all onions, suitable for sauces, soups, gravy, onion rings, grilling, frying, sauteed and about a million other useful things. Bubba Gump Shrimp hasn’t got anything on the Vidalia Sweet Onion. Jackson, Georgia. Flawed like any other town but you somehow manage not notice these. It’s the people, the places, the buildings and landmarks, the climate, the lake and a rich history that make it what it is. It has Tradio every day for all of us who won’t be caught dead at a yard sale, Big D’s and Mrs. Brown on the square, Bill’s and Jimmy’s, 35 convenience stores, a ’41 Fire Engine and a 138 year-old newspaper. Welcome Home. Yes we pass them down!! Daddy’s ’87 Silverado is parked in my yard. 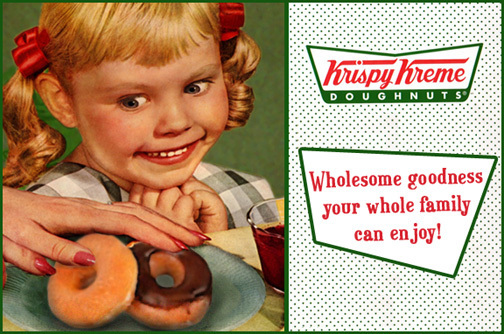 OK now I want Krispy Kreme… let’s make a trip to Ponce De Leon. The tractor addendum: I learned to drive on my uncle’s 1947 Super A Farmall. I didn’t get to drive the Redbelly until later. The sense of place is another…being ‘from’ somewhere is not your current residence, as you may have lived here 30 years, but you ain’t from there. I never got to drive a tractor but I came pretty close one time to “borrowing”one! You are right about sense of place..we are all pretty particular about where we are from but insult one of us and all of a sudden we’re ALL from “down here”!